It is the safest and most durable 3D printer pen in the market today. And if you’ve done good research, you’ll certainly find that TRLIFE 3D pen has the best balance between affordability and advanced features you’ll ever find. Although we always advise parents to supervise their kids when they’re using the 3D printing pens, you can be sure that the filament won’t burn or cause any fire and, therefore, very safe for kids. The procedure is straightforward. All you need is to plug the pen into a USB port and allow the pen to heat until the status indicator turns from red to green. After that, attach the filament into the hole, and then click on the key control button and you’ll be ready to draw. 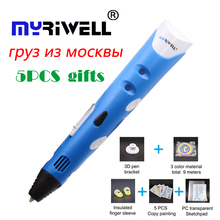 The ergonomic and lightweight design with Patented Aerial Ceramic Nozzle allows the kids and adults to manipulate and move the pen at different angles for better results. Promise to offer 100% refund if a client is not satisfied with the performance.